A Writing Retreat in Zihuatanejo, Mexico! 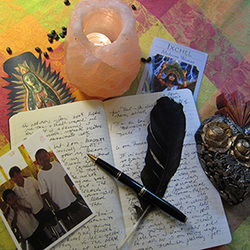 Join Lisa B. Martin and William Kenower for a week-long writing, creativity and cultural retreat January 25 to 31, 2014, in tropical Zihuatanejo, Mexico. Co-hosts Lisa Martin and William Kenower (williamkenower.com) have teamed up to offer a truly special writing and journey experience. A destination made famous in the fictional conclusion of Stephen King’s The Shawshank Redemption, Zihuatanejo has much to offer writers, artists, and others seeking the 'magic of place' to refresh and reignite the creative spirit. Explore the power of "journey" to ignite the story-telling Muse in life vision, vocation, and the creative process. Discuss craft and technique, experiment with free-writing, and share works-in-progress in a nurturing, energizing setting. Enjoy several hours each morning of workshop time, share evening readings, make local gallery visits, and meet with special visiting writers and artists. Experience optional excursions to engage in a local literacy project with indigenous children, and visit seldom-seen sacred sites. Space is limited to 15 participants, so register today.